Chuck is an old friend of the current library director, Mark Contois, who joined us in the lobby to tell the story of the building’s creation from the client’s viewpoint. 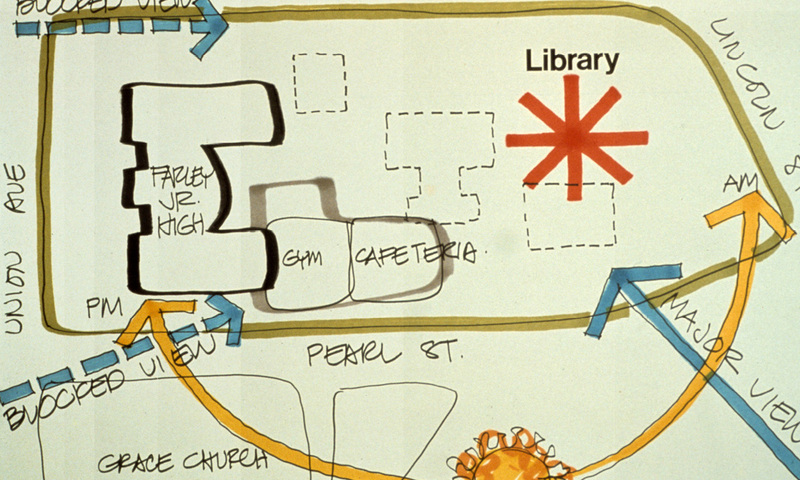 Mark was 26 years old at the beginning of his career when he was assigned to write a grant seeking funds for the design and construction of a new library from the Public Works Employment Act of 1976. Much to his surprise, the town received 4.5 million dollars, the largest grant in the Commonwealth. Based on a 1974 study by Huygens and Tappé, a site was selected in the downtown area, near the Town Hall, the senior citizen center and the recently established Danforth Art Museum—to enhance an emerging “common.” The legislation required construction to start in order to put people to work, so three small buildings on the site were demolished while the design was being finalized. Beginning the library project with little design or construction experience, Chuck remembers trying to manage conflicts between the Library’s Board of Trustees and the Permanent Town Building Committee and to move the project along. He credits Bill Dickson, who was in charge of Buildings and Grounds at MIT and a Permanent Town Building Committee member, with giving counsel and support in helping him navigate the situation. He recalls the design team’s structure this way: “Tony was the salesman who charmed the ladies on the Board, Rem was the designer, and a young Turk named Stuart Carter did all the work.” Stuart gave equal credit to Chuck’s ability to get things done. The initial desire was for a two-story structure built out to the sidewalk to enhance the urban condition and bring activity downtown. However, the zoning commission would not compromise on the required 20 foot setback, so the design evolved into a three-story scheme with the children’s library on the lowest level. A high water table set the lowest floor elevation only about six feet below grade, which gave the opportunity to bring natural light into the space through windows looking out to a sunken garden. As a result, the main level is above the street and reached by exterior stairs and ramps. The two main entrances (on opposite sides of the building) are connected by an interior street and lit by north facing skylights at the top of an atrium. The floor of this space is dark stained oak end blocks which still look good after 36 years of traffic. Library Director Mark Contois has recently installed café tables, pendant lighting, and local art, making this space an inviting hangout instead of just a pass through. The main circulation desk extends into this interior street and controls all traffic, with the main stair just opposite the desk and the second floor overlooking the lobby. The library has an open plan for maximum flexibility. However, the composition of the plan creates numerous alcoves that invite quiet reading and studying. Long bands of glass under low soffits create such areas along the two exterior walls away from the noisier Lincoln Street. 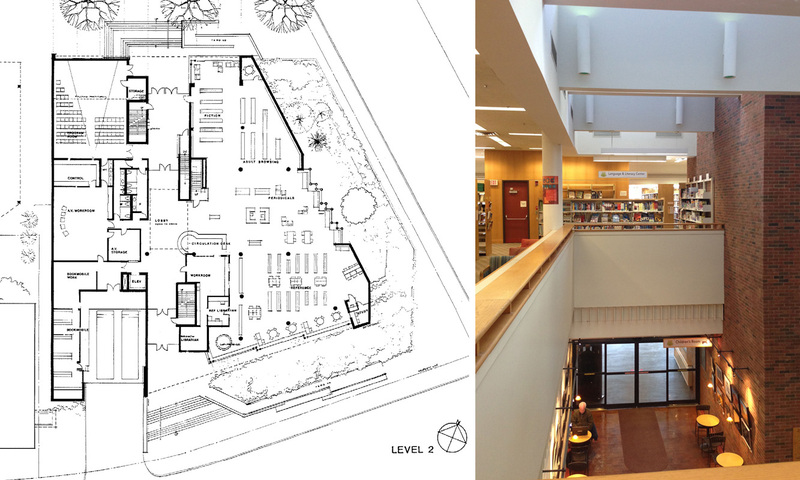 Project Manager Stuart Carter recalls the design as being influenced by Alvar Aalto, the Finnish architect who designed many renowned libraries that handle natural light in effective ways. 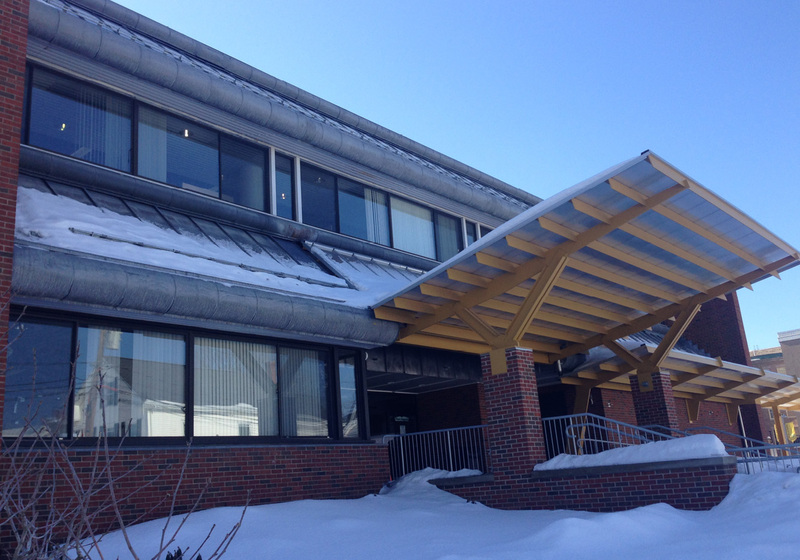 This influence can be seen in the north facing roof monitors, blond wood, white walls, and round columns. The exterior design is influenced mainly by the site conditions. To the east is a busy street and to the west was a parking structure. The walls that face these sides are masonry, bracketing the mostly glass north and south elevations that face the quieter residential scaled streets. The glass is shaded by sloping lead coated copper roofs that bring a domestic scale to the building, tying it to the houses across the street. I arrived for my meeting with Mark and was directed upstairs to his office. As I approached the glass walled administration suite, a feeling of déjà vu came over me. I pulled from my briefcase the black project book that I brought from our project archives and quickly flipped through the original photos, stopping at a picture from just outside the entrance—the same desks in the same locations, the same file cabinets, the same chairs. The only things different were the equipment, the carpet and the occupants. When I told Mark of my discovery, he chuckled and said “we still have the same furniture everywhere. This place is a time capsule from the architectural standpoint.” As we toured the library, Mark pointed out other items such as the original light fixture above the circulation desk and the built-in furniture and noted that they had just replaced the original paper signs on the stacks a few years back. It is remarkable for an interior to last this long and for an exterior design to be timeless enough that it is difficult to pinpoint its decade of construction. Framingham residents have enjoyed the library for approximately $300/day based on its original design, construction cost and completion date. This demonstrates incredible value in public construction—an area that today is much maligned. Mark is an affable guy who talks about customer touch points, understands the quality of his building and the importance of its maintenance. In the last year, he has taken the down the adjacent garage, which did not stand the test of time due to crumbling concrete from rock salt and lack of maintenance. The same rock salt destroyed the original concrete stairs, which Chuck noted were a value engineering change from granite 36 years earlier. When asked what he had learned in 40 years of library projects, Chuck said, “You need to be willing to make compromises, but make good compromises.” The entrance sidewalk and ramp have recently been rebuilt and covered with a canopy that contrasts with the building but brings a welcome shot of color. Originally the children’s library was located on the lower level to contain the noise. Mark told me that he likes noisy libraries and wishes he had a two story building at grade or at least a better connection to the lower level. He longs for a café in the building and notes that the busiest Dunkin Donuts in Framingham is diagonally across from the library. Mark praised the flexibility of having a building suitable for book stack loading in all bays, allowing the collections to grow and change over the years. Mark also noted that the community room, accessible when the library is closed, has been a huge success and is almost continually booked. This has become a fixture of many libraries in the Commonwealth. How did we get a library project? Tony Tappé’s wife worked for the book publisher Little, Brown and Company. She went back to school, got a degree in library science and went to work for the Bureau of Library Expansion, a program to build libraries in the Commonwealth. Tony was hired to travel around the state to evaluate library construction and certify pay requisitions. After observing many libraries under construction, he decided that he too could design a library and thus put together a “Manual for Planning a Library.” He made the rounds, visiting towns with small historic libraries, offering his manual and the “my wife is a librarian, so I know libraries” pitch. Tony’s success led the firm to a number of library commissions. Tony would later expand the manual into a book, and his future firm Tappé Associates would become well-known for their expertise in library design. I would be interested to see this “Manual for Planning a Library” do we have a copy in the office? Yes, we do. I can show it to you.